Richard Garriott has filed suit against NCsoft over millions of dollars he lost as a result of his dismissal from the company - and oh yes, he didn't quit, he was fired. Fallout from the falling-out between Garriott and NCsoft is getting ugly. 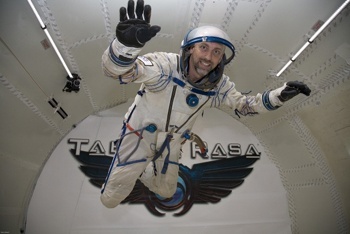 Garriott, the famed Ultima mastermind who joined NCsoft to try his hand at MMOG development with Tabula Rasa, left the company in late 2008, saying his much-hyped trip into space had "sparked some new interests" he wanted to pursue. Less than a month later (and only two months after denying it would do so), NCsoft pulled the plug on Tabula Rasa and that, by all appearances, was that. But now Garriott has launched a lawsuit against NCsoft alleging that after firing him, the company "internally re-characterized" his dismissal as a voluntary resignation, resulting in the loss of millions of dollars for Garriott when he was essentially forced to cash out his stock options prematurely. "If NCsoft terminated Mr. Garriott's employment (which it did) then the [stock] options - worth tens of millions of dollars - would remain in effect until 2011; but if Mr. Garriott resigned voluntarily (which he did not), then NCsoft might have terminated those options... within ninety days of his departure," his complaint says. "NCsoft forced Mr. Garriott into a Hobson's choice of exercising his options... and forced him to sell into one of the worst equity markets in modern history..."
Garriott says NCsoft fired him while he was still in quarantine from his space flight and has "refused to retract its misstatements regarding the nature of Mr. Garriott's departure and the cancellation of his stock options." He's accusing the company of breach of contract, fraud and negligent misrepresentation, to the tune of $27,000,000 in actual damages. 27 million dollars. I guess that's what you call a "surprise twist." I, and I'm sure a lot of other people, assumed the timing of Garriott's departure was mutually agreed upon as a way to allow him to save a little face before Tabula Rasa was taken out behind the woodshed. It never even occurred to me that he was fired. You rein him in a little, you knock a few perks off his budget, you maybe give him a stern talking-to about the need to focus on designing games instead of being a rich crazy guy, but firing him? Who fires Richard Garriott? A full copy of the complaint can be downloaded here. Needless to say, we'll be watching this one closely.